Are you looking for extremely popular and attractive designable Mountain Bike? Diamondback response Xe 29er is here and of course, you are the right place to look honest review. Diamondback was the first bike model I owned, and it’s no surprise that I’m still a loyal fan years later. Every other month I sit down and look at the new bikes Diamondback has created, and if the money is there, I’ll make an investment. Some say I’m a little obsessed, but I think that everyone who’s owned a Diamondback bike is obsessed as well. The Response model in, particular is one of my favorites. And out of the models available, the XE 29er is my go to bike. This highly popular bike embodies everything that Diamondback is known for, including reliability, durability, and affordability. The XE 29er has managed to cross all rider levels, meaning that beginner and advanced riders can enjoy the amazing performance it delivers. So let’s go ahead and review the XE 29er so that you can determine whether this bike should be on your Christmas list. The Diamondback XE 29er comes with amazing features which are rare for a bike of its price. This brilliant mountain bike boasts of a lightweight aluminum frame, a smooth 100mm suspension fork, large 29-inch wheels, a quality 7-speed Drivetrain, and reliable mechanical disc brakes. All of these components work in tandem to give you a fun and memorable ride. As you may already know, the most important component of a bike is its frame. The frame of the XE 29er is different from the XE 26er in terms of aesthetics; however, the underlying reliability is the same. This frame has been constructed using 6061-T6 aluminum, which is remarkably strong, lightweight, and durable. This frame will give you the support that you need while you are riding, and it will also stand up to abuse from trails. Additionally, the mountain bike has a 100mm suspension fork, which will effectively absorb shock from rough surfaces. This means that you can ride smoothly over rough terrain without losing control or balance. When it comes to wheels, you have 3 options; 26-inch, 27.5-inch, or 29-inch wheels. Each wheel size has its own pros and cons, and my personal favorite is the 29-inch wheel. You can imagine how happy I was to discover that this XE Response has large 29-inch wheels. These wheels allow you to easily ride over obstacles such as roots, rocks, ruts, and water crossings. In fact, you will be able to ride on rough trails without any hassle or stress, which cannot be said for the smaller wheel sizes. These wheels also give you the stability that you need on all surfaces, ensuring that you can travel without fear of getting into an accident. You should use bike helmet for avoid injury. When it comes to the Drivetrain of your bike, you need to look at ease of operation and range of gears. Diamondback has integrated a 7-speed Drivetrain into the XE Response 29er, which gives you an array of gears that you can take advantage of. This Drivetrain allows you to travel at top speeds, and to shift gears quickly and smoothly. When it comes time to slow down, you can pump the reliable mechanical disc brakes. These brakes deliver powerful stopping power so that you can have a safe journey in all conditions. 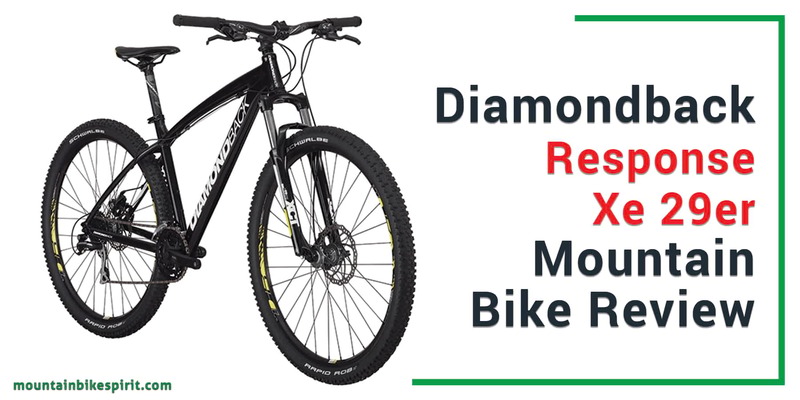 The Diamondback Response is an exceptionally popular bike. If you don’t believe me, check out the overwhelmingly positive reviews from its customers. Many customers are happy with the affordable nature of the bike, especially considering the amazing quality you get for such a low price. Furthermore, the attractive design of the XE 29er is a big selling point, and customers say that the bike’s style is unparalleled for models in its class. The smooth suspension is also another positive aspect that customers love, as well as the stability and control that are possible because of this suspension.